On April 10, 2018, AFCEA Bethesda hosted a GSA IT-70 Health IT SIN SIG (shared interest group) Meeting. G2Xchange’s Steve Plaugher shared his takeaways from the meeting for those unable to attend. 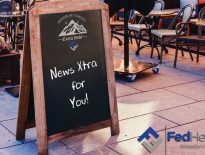 His post has been shared here with permission from the original source – G2Xchange. For those who missed it, included below are Steve Plaugher’s notes from yesterday’s DHA Health IT SIG meeting. When: DC at GSA Building Who: Between 60-80, 10-15 GSA/DHA Government employees. Expect continued reliance on NASA SEWP for hardware purchases – and services through GSA IT-70/Health IT SIN. If a company has not gone through the process of obtaining the Health IT SIN on their schedule contract, then they can work with Roya Konzman ([email protected]) about getting ‘fast-tracked’. DHA is in the midst of planning another “Industry Day” in mid-June. DHA plans to release a more detailed forecast in conjunction with that event. Details will be announced on FBO and on GSA Interact. 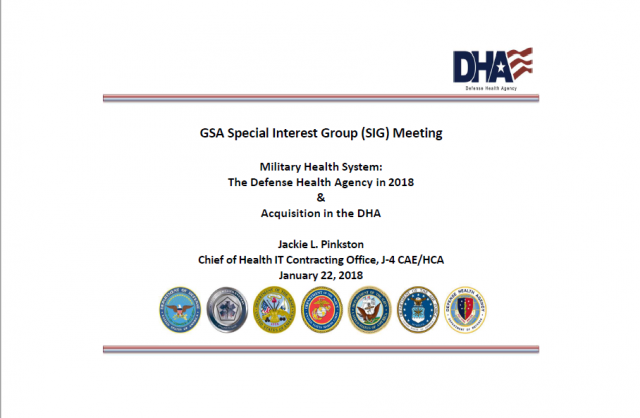 Jackie Pinkston committed to regular postings on the GSA Interactive Blogs (https://interact.gsa.gov/), specifically, on the DHA HIT-DHA/GSA Partnership forum. DHA is working to consolidate Service Component contracts into Enterprise-Wide support contracts, to increase buying power, and to reduce duplication of services and systems, yet be flexible enough to support all regional facilities and MTFs. New IDIQ type contracts may be utilized depending on what is determined to be in the best interest of the DHA. One of their largest challenges is the blending of the Service Components into one cohesive organization. DHA has experienced many delays and setbacks due to the high level of protests on contract awards. A new MHS Genesis contract lead is Matt Hudson (former SPAWAR). I will be looking to get more details about the telehealth opportunity Jackie mentioned was on the near horizon. I didn’t fully grasp their IDIQ style approach to transition the MTFs over their two-year goal. Jackie mentioned it being tiered 1-3, but I will be looking to gain a better understanding of what that tier structure looks like. Why don’t other agencies do more of this? Great job by Jackie and AFCEA to pull this together. You can also find additional information about the Health It SIG on the AFCEA Bethesda website https://bethesda.afceachapters.org/?q=content/health-information-technology-sig. You can also connect with Steve directly at [email protected]. For the past four years Steve has been providing a competitive advantage for some of the most highly successful firms in town as a leader driving competitive intelligence and market research efforts. 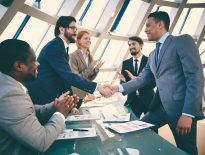 For nearly a decade prior to that, he led product development, customer service, and market research for Centurion Research Solutions, acquired by Deltek’s GovWin in 2013. He is now Executive Vice President of Market Research and Product Development at G2Xchange, LLC.